The 2018 season ended with the New England Patriots being crowned Super Bowl Champions for the sixth time in franchise history. With the playoffs in the rear view and all 32 teams now focused on the offseason the coaching carousel was finally able to complete its final spin. On Monday morning the Cincinnati Bengals and Miami Dolphins were able to officially announce Zac Taylor and Brian Flores as their Head Coaches. In the 2019 edition of the hiring cycle, there were eight head coaches hired in total with only two of them having defensive backgrounds – Vic Fangio and Brian Flores. The NFL has clearly shifted towards an offensive mindset. Bruce Arians, Kliff Kingsbury, Zac Taylor, Matt LaFleur, Freddie Kitchens, and Adam Gase all represent that trend. Kingsbury has never coached in the NFL, Taylor has limited experience as an offensive coordinator and quarterback coach, LaFleur was only an offensive coordinator for two seasons in the NFL, Kitchen was an offensive coordinator in the NFL for half of a season, and Adam Gase’s time in Miami was far from ideal with an overall record of 23-25. Those statements are not meant to be knocks on any of the above coaches, as each of them certainly showcased why they deserved their respective jobs, but simply to show the current state of the NFL which currently values offense over defense. While six teams were zigging, two teams zagged. The Broncos hired long-time defensive coordinator Vic Fangio, who for the better part of the past decade has been one of the better Defensive Coordinators in the NFL, while the Dolphins went with the lesser-known Flores who the jury is still out on. Is he ready for the challenge of building a team? Can he be successful on his own away from Bill Belichick and "The Patriot Way"? Before we can begin to attempt to answer those questions, we need to understand what Brian Flores is all about. Flores, a native of New York, shined on the gridiron from an early age. As a High School Senior, he rushed for 1,550 yards and 17 touchdowns and accepted a scholarship to continue his playing career at Boston College. Although he had aspirations of playing in the NFL, an injury forced Flores to hang up the cleats early. In 2004, his first year out of school, Flores landed a job as a Scouting Assistant with the Patriots before eventually becoming a Pro Scout in 2006. A couple of years later Flores made the transition to a coaching role on Belichick’s staff when he was named a Special Teams Assistant. As the years passed, Flores continued to ascend the coaching ranks on the defensive side of the ball by coaching Safeties from 2012-2015 and Linebackers from 2016-2018. After the Lions hired Matt Patricia as their head coach, Belichick handed over the defensive play-calling responsibilities to Flores. In his lone year in that role, the Patriots won the Super Bowl in a large part because of how their defense played down the stretch and especially on Super Bowl Sunday. With 4 Super Bowl titles now under his belt, the Dolphins decided to pry him away from New England by making him their 13th Head Coach in Miami Dolphins history. Optimum Scouting’s President, Eric Galko, has described Flores as the ultimate player’s coach. Galko went on to say that Flores has the respect of all of his players in the locker room, and many coaches admire his ability to connect with the players and lead them. What about his defensive tendencies? While Bill Belichick is heavily involved in what New England does on defense it was promising to see that Matt Patricia's game plan vs the Rams this year frustrated Jared Goff. The importance of this being is that the apple may not fall far from the tree and that some of the core defensive principles, tendencies and philosophies of the Patriots could carry over to Miami. After studying Flores during the regular season, the Super Bowl was quite remarkable because he broke some of their main tendencies in order to stop one of the most potent offenses in the NFL. The Patriots are one of the more man-coverage heavy teams in the NFL. Schematically, this helps to confuse defenses, send more rushers, have more unique blitzes and fronts among other things. 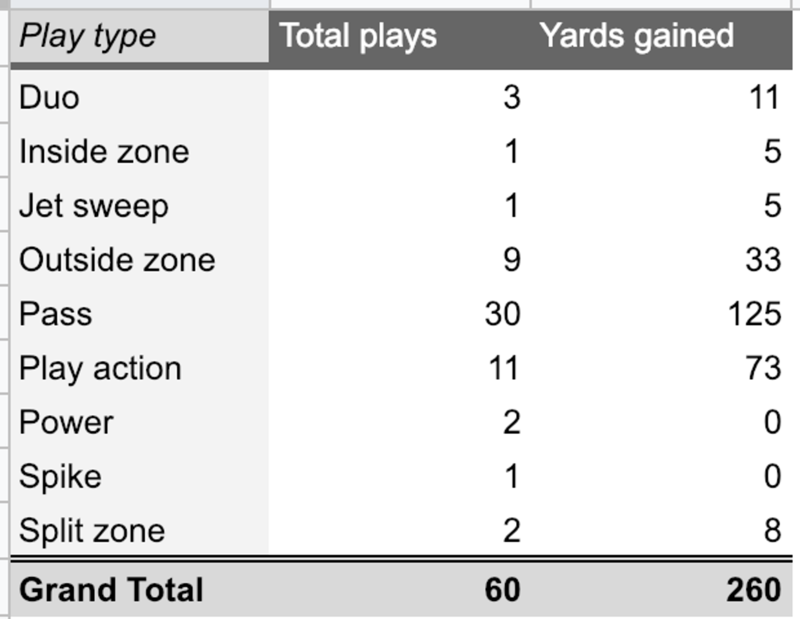 While the Patriots ran a fair amount of man coverage, the key was the usage of personnel. Stopping Sean McVay’s offense is not an easy task, but one of the keys is having speed on the field. The Rams use 11 personnel more than a vast majority of NFL teams, and the best way to match that speed is with nickel and dime packages. The Patriots were no strangers to nickel and dime packages during the regular season, but the remarkable aspect was their secondary’s effectiveness in Quarters Coverage in particular. In studying the Patriots’ defense before the Super Bowl, Quarters (Cover 4) was not one of their staple coverages. Not that they did not utilize it, but it was not one of their mainstays like Cover 3 or Man Coverage was. However, their efficiency in Quarters coverage in the Super Bowl played a role in their defensive dominance. 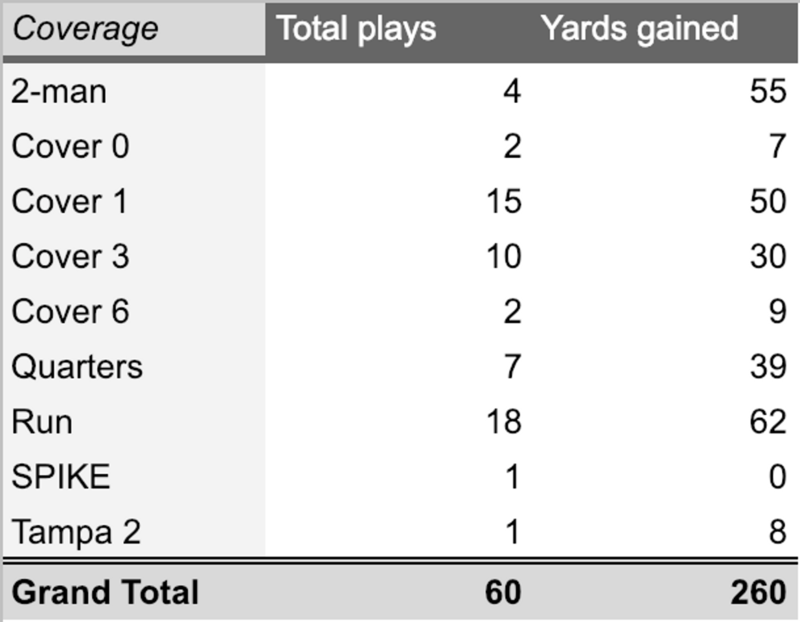 It may have only been seven plays, according to my charting, but they forced a turnover and only allowed four catches. It's also important to note that after the game Belichick gave credit to Flores for calling the blitz that resulted in Goff's INT late in the 4th quarter. Another critical ingredient to stopping McVay is his outside zones (wide zone) plays. They use unique formations, shifts, motions, and anything else they can to disguise the zone run even though the blocking principles and running backs reads are the same. With their nickel and dime personnel, the Patriots were able to adequately fill the gaps with different fronts and putting more bodies in the box. They used traditional 4-2-5 fronts, base 4-3 fronts, and other five and six-man fronts. The method to their madness was simple: If they flush everything to the outside, their speed would be able to handle the rest. However, these aggressive fronts and boxes would not have worked if New England’s secondary was not able to match up in man coverage and make plays in the running game, but that is not all that they did. Deception is one of the oldest tricks in the NFL. 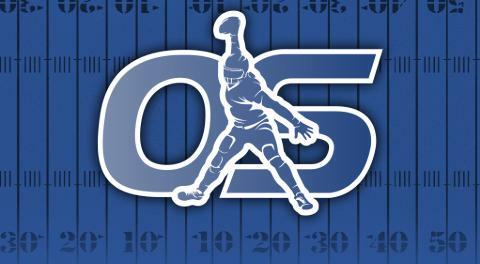 Disguising plays and coverage is something that has been around in the NFL since the league’s inception, but it is becoming more critical for defenses to master this skill as offenses are getting more effective and creative. With the rise of innovative offensive coordinators and more pass-heavy concepts, teams cannot just sit back in their defensive coverage and tell the truth pre-snap. Instead, disguising their looks is a necessity now more than ever. 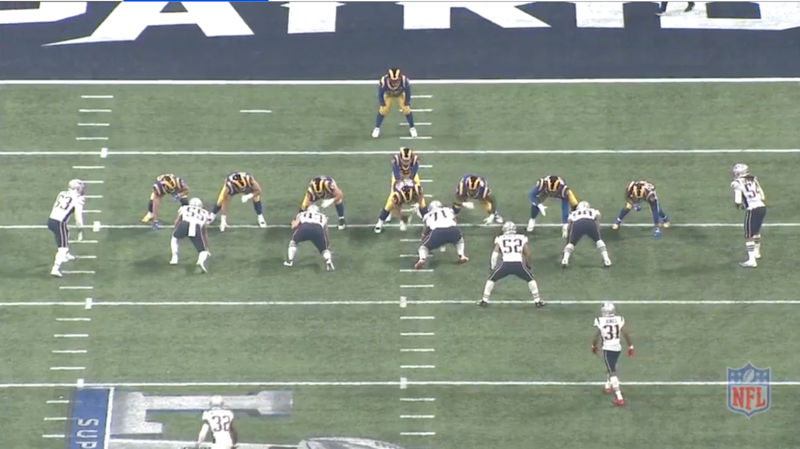 The Patriots tricked Jared Goff on plenty of occasions with odd formations and post-snap movement. The first clip showcases the Patriots disguising a potential blitz into a Cover 3, which is one of their staple coverages. Again, this is nothing new to the NFL or football in general, but it gave Jared Goff something to think about pre-snap. He had to identify the coverage quicker and react faster. The true beauty came in the second clip. With the Patriots again having a ton of bodies in the box, Goff must have been trying to diagnose the blitz. He even motions over a tight end to help block. However, the constant shifting and movement switch up the responsibilities of the offensive line. Combine that with the stunts, the right tackle was on an island and was beaten cleanly by an inside move and the ball was swatted at the line of scrimmage. In his opening press conference on Monday, Flores spoke on the importance of versatility and adapting to your opponent. "Each game is different. Each opponent is different. Their strengths, their weaknesses are different every week, so every week we’re coming up with a different plan. 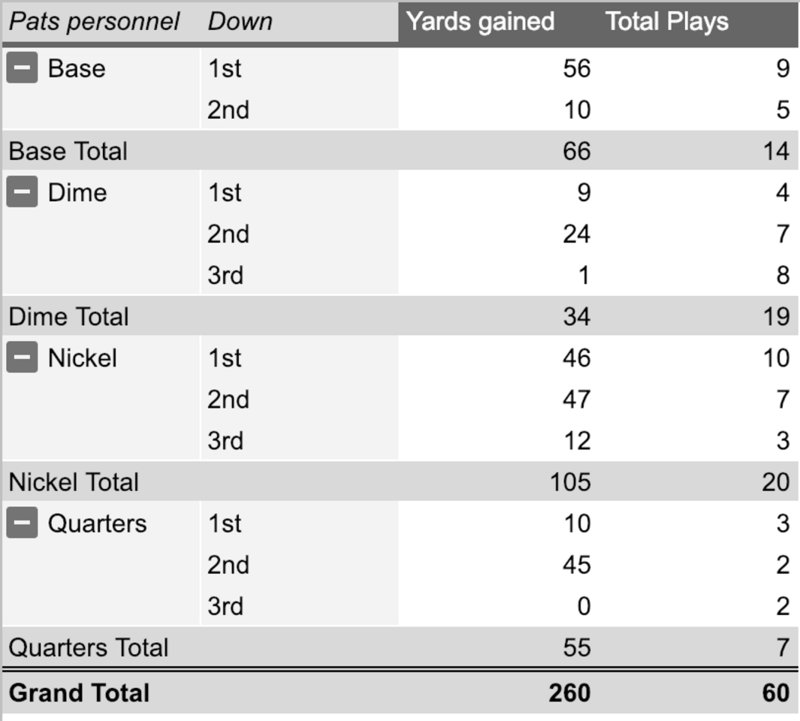 A lot of that is tied to who you have personnel-wise, what we can do versus what they can do. It could be different every week." It's this type of forward-thinking that made the Patriots go from 25th to 5th in takeaways in 2019. It's this type of game planning that allowed the Patriots to shut out the top two offenses in the NFL in the 1st half of their last two playoff games. It's this type of attention to detail and self-awareness of your team and the opponent that is going to be needed to bring the Dolphins back into the playoff picture on a routine basis. 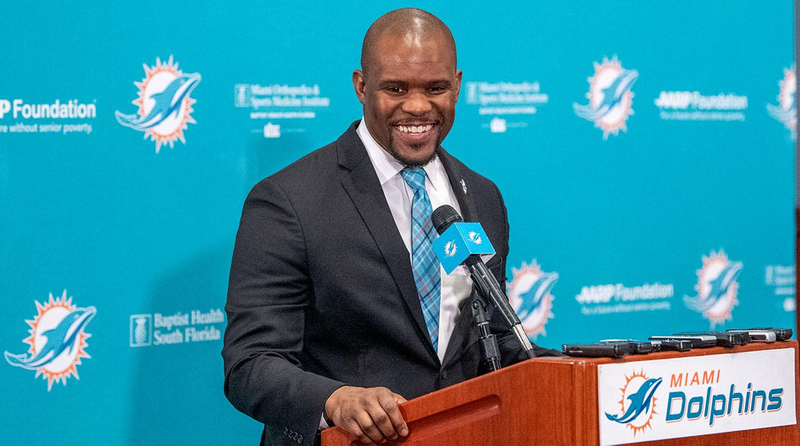 The Dolphins are in a rebuilding mode but with Brian Flores at the helm the future is bright and they might be back in the playoff hunt sooner than you think. Just give him a year or two to work his magic.